Thank you for hosting after your difficult week. My heart goes out to those families. Mary, you are such an artist! I love the way you put these images together. On a separate note, I am so very sorry for your loss...there are no words for a situation like this. Mary, the White Christmas mosiac is just lovely. And I can understand why you would need to feel calm. I will keep you and the families in my prayers. I LOVE S N O W; therefore, I'm always dreaming of a White Christmas! Your mosiac, also, brings to mind the hymn "O Little Town of Bethlehem". Especially the verse that reads..."how silently, how silently, the wonderful gift is given"... Calm, peaceful, tranquil. Prayers are continuing for all of those touched by the recent tragedy in your community. Mary, this beautiful mosaic will stay in my heart during the joyous Christmas season! Stunning mosaic. My thoughts and prayers are with you. Your post are always so pretty. Love this mosaic as well. Beautiful photographs ~ you could show this year after year and I do not think any of us would tire of it! Thank you for hosting this inspiring blog party. Your photography is simply stunning. 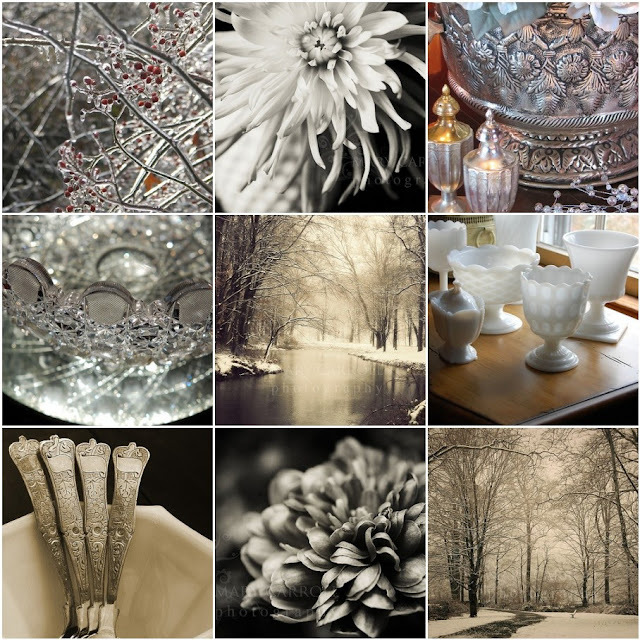 Especially love the ice, and the b&w florals. Breathtaking, really. Don't know if this is a dup. comment - seems I am having probs. leaving comments on logs these days. Just wanted to say - Thanks for hosting again this week. Love your photos - especially the last one on the bottom, right. I love those photos! It has inspired me actually to go around my little world and look at things all in a certain color scheme. I'll have to take some pictures! Your White Christmas mosaic is really pretty ... magical, really. Thanks for hosting! Thank You for hosting, I know it has been a difficult time for you and your family. Thinking of you. Thinking of what you and your family and community are going through I completely forgot to say your mosaic is lovely. I love the white and silver. Your White Christmas is lovely! Beautiful. I have always dreamt of having a white Christmas. Perhaps one day I will. Sending my thoughts and prayers at such a sad time for your family, community, and especially the families of the two young men. Great photographs, some of them seem magical.. Am joining in today after a long time :) Good day to you! A fantastic Mosaic with all shades of white. Great ! Such a lovely mosaic. The whites and glistening ice are truly magical. My heart really goes out to those who lost their loved ones. What a wonderful white Christmas mosaic!! Mary your collage is so exquisite. Thanks for sharing such lovely mosaics with us! My heart and prayers go out to those that have lost their loved ones. It is never easy when we lose someone we love. It is even harder when we lose them during the holidays. Loving prayers for all. I love this white Christmas theme, really so beautiful and I hope that your Mosaic Monday leads to a very pleasant week ahead. An extraordinarily beautiful mosaic! Love the silver and white combination. You get never tired of those colours. White and silver are always so elegant, and a balm, even to those of us who love the reds and greens. I followed along with the passing of the boys and even looked them up online. Such a sad situation. Having children you know it is one of our deepest fears, losing a child to soon. I do hope the families receive plenty of love and support in the coming months. They will surely need it. Your beautiful mosaic reminds me of all the reasons why I love this season! 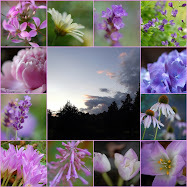 I am definitely going to set aside the time this week to take your tutorial on making photo mosaics! Thanks Mary for adding so much beauty to my day! I just stopped by to see your beautiful photography. I didn't join Mosaic Monday this week, but I plan on doing so next week. This mosaic is stunning. Each photograph links so beautifully to your design. Mary, what a beautiful and serene image -- the compilation of all the white and silver. My heart aches for the families who have suffered such a terrible loss, and for your community; I'm so sorry. How sad and tragic. The combinations of white and silver are wonderful.